This article is about the planet. For other uses, see Saturn (disambiguation). Saturn is the sixth planet from the Sun and the second-largest in the Solar System, after Jupiter. It is a gas giant with an average radius about nine times that of Earth. It has only one-eighth the average density of Earth, but with its larger volume Saturn is over 95 times more massive. Saturn is named after the Roman god of agriculture; its astronomical symbol (♄) represents the god's sickle. 62 with formal designations; innumerable additional moonlets. − 1m 19s , based on studies of the planet's C Ring. The planet's most famous feature is its prominent ring system that is composed mostly of ice particles, with a smaller amount of rocky debris and dust. At least 62 moons are known to orbit Saturn, of which 53 are officially named. This does not include the hundreds of moonlets in the rings. Titan, Saturn's largest moon, and the second-largest in the Solar System, is larger than the planet Mercury, although less massive, and is the only moon in the Solar System to have a substantial atmosphere. Saturn is a gas giant because it is predominantly composed of hydrogen and helium. It lacks a definite surface, though it may have a solid core. Saturn's rotation causes it to have the shape of an oblate spheroid; that is, it is flattened at the poles and bulges at its equator. Its equatorial and polar radii differ by almost 10%: 60,268 km versus 54,364 km. Jupiter, Uranus, and Neptune, the other giant planets in the Solar System, are also oblate but to a lesser extent. The combination of the bulge and rotation rate means that the effective surface gravity along the equator, 7000896000000000000♠8.96 m/s2, is 74% that at the poles and is lower than the surface gravity of Earth. However, the equatorial escape velocity of nearly 7004360000000000000♠36 km/s is much higher than that for Earth. Saturn is the only planet of the Solar System that is less dense than water—about 30% less. Although Saturn's core is considerably denser than water, the average specific density of the planet is 7002690000000000000♠0.69 g/cm3 due to the atmosphere. Jupiter has 318 times Earth's mass, and Saturn is 95 times Earth's mass. Together, Jupiter and Saturn hold 92% of the total planetary mass in the Solar System. Despite consisting mostly of hydrogen and helium, most of Saturn's mass is not in the gas phase, because hydrogen becomes a non-ideal liquid when the density is above 7001100000000000000♠0.01 g/cm3, which is reached at a radius containing 99.9% of Saturn's mass. The temperature, pressure, and density inside Saturn all rise steadily toward the core, which causes hydrogen to be a metal in the deeper layers. Standard planetary models suggest that the interior of Saturn is similar to that of Jupiter, having a small rocky core surrounded by hydrogen and helium with trace amounts of various volatiles. This core is similar in composition to Earth, but more dense. Examination of Saturn's gravitational moment, in combination with physical models of the interior, has allowed constraints to be placed on the mass of Saturn's core. In 2004, scientists estimated that the core must be 9–22 times the mass of Earth, which corresponds to a diameter of about 25,000 km. This is surrounded by a thicker liquid metallic hydrogen layer, followed by a liquid layer of helium-saturated molecular hydrogen that gradually transitions to a gas with increasing altitude. The outermost layer spans 1,000 km and consists of gas. Saturn has a hot interior, reaching 11,700 °C at its core, and it radiates 2.5 times more energy into space than it receives from the Sun. Jupiter's thermal energy is generated by the Kelvin–Helmholtz mechanism of slow gravitational compression, but such a process alone may not be sufficient to explain heat production for Saturn, because it is less massive. An alternative or additional mechanism may be generation of heat through the "raining out" of droplets of helium deep in Saturn's interior. As the droplets descend through the lower-density hydrogen, the process releases heat by friction and leaves Saturn's outer layers depleted of helium. These descending droplets may have accumulated into a helium shell surrounding the core. Rainfalls of diamonds have been suggested to occur within Saturn, as well as in Jupiter and ice giants Uranus and Neptune. Methane bands circle Saturn. The moon Dione hangs below the rings to the right. The outer atmosphere of Saturn contains 96.3% molecular hydrogen and 3.25% helium by volume. The proportion of helium is significantly deficient compared to the abundance of this element in the Sun. The quantity of elements heavier than helium (metallicity) is not known precisely, but the proportions are assumed to match the primordial abundances from the formation of the Solar System. The total mass of these heavier elements is estimated to be 19–31 times the mass of the Earth, with a significant fraction located in Saturn's core region. 4SH) or water. Ultraviolet radiation from the Sun causes methane photolysis in the upper atmosphere, leading to a series of hydrocarbon chemical reactions with the resulting products being carried downward by eddies and diffusion. This photochemical cycle is modulated by Saturn's annual seasonal cycle. A global storm girdles the planet in 2011. The head of the storm (bright area) passes the tail circling around the left limb. Saturn's atmosphere exhibits a banded pattern similar to Jupiter's, but Saturn's bands are much fainter and are much wider near the equator. The nomenclature used to describe these bands is the same as on Jupiter. Saturn's finer cloud patterns were not observed until the flybys of the Voyager spacecraft during the 1980s. Since then, Earth-based telescopy has improved to the point where regular observations can be made. The composition of the clouds varies with depth and increasing pressure. In the upper cloud layers, with the temperature in the range 100–160 K and pressures extending between 0.5–2 bar, the clouds consist of ammonia ice. Water ice clouds begin at a level where the pressure is about 2.5 bar and extend down to 9.5 bar, where temperatures range from 185–270 K. Intermixed in this layer is a band of ammonium hydrosulfide ice, lying in the pressure range 3–6 bar with temperatures of 190–235 K. Finally, the lower layers, where pressures are between 10–20 bar and temperatures are 270–330 K, contains a region of water droplets with ammonia in aqueous solution. Saturn's usually bland atmosphere occasionally exhibits long-lived ovals and other features common on Jupiter. In 1990, the Hubble Space Telescope imaged an enormous white cloud near Saturn's equator that was not present during the Voyager encounters, and in 1994 another smaller storm was observed. The 1990 storm was an example of a Great White Spot, a unique but short-lived phenomenon that occurs once every Saturnian year, roughly every 30 Earth years, around the time of the northern hemisphere's summer solstice. Previous Great White Spots were observed in 1876, 1903, 1933 and 1960, with the 1933 storm being the most famous. If the periodicity is maintained, another storm will occur in about 2020. The winds on Saturn are the second fastest among the Solar System's planets, after Neptune's. Voyager data indicate peak easterly winds of 500 m/s (1,800 km/h). In images from the Cassini spacecraft during 2007, Saturn's northern hemisphere displayed a bright blue hue, similar to Uranus. The color was most likely caused by Rayleigh scattering. Thermography has shown that Saturn's south pole has a warm polar vortex, the only known example of such a phenomenon in the Solar System. Whereas temperatures on Saturn are normally −185 °C, temperatures on the vortex often reach as high as −122 °C, suspected to be the warmest spot on Saturn. A persisting hexagonal wave pattern around the north polar vortex in the atmosphere at about 78°N was first noted in the Voyager images. The sides of the hexagon are each about 13,800 km (8,600 mi) long, which is longer than the diameter of the Earth. The entire structure rotates with a period of 10h 39m 24s (the same period as that of the planet's radio emissions) which is assumed to be equal to the period of rotation of Saturn's interior. The hexagonal feature does not shift in longitude like the other clouds in the visible atmosphere. The pattern's origin is a matter of much speculation. Most scientists think it is a standing wave pattern in the atmosphere. Polygonal shapes have been replicated in the laboratory through differential rotation of fluids. HST imaging of the south polar region indicates the presence of a jet stream, but no strong polar vortex nor any hexagonal standing wave. NASA reported in November 2006 that Cassini had observed a "hurricane-like" storm locked to the south pole that had a clearly defined eyewall. Eyewall clouds had not previously been seen on any planet other than Earth. For example, images from the Galileo spacecraft did not show an eyewall in the Great Red Spot of Jupiter. The south pole storm may have been present for billions of years. This vortex is comparable to the size of Earth, and it has winds of 550 km/h. Cassini observed a series of cloud features nicknamed "String of Pearls" found in northern latitudes. These features are cloud clearings that reside in deeper cloud layers. Saturn has an intrinsic magnetic field that has a simple, symmetric shape – a magnetic dipole. Its strength at the equator – 0.2 gauss (20 µT) – is approximately one twentieth of that of the field around Jupiter and slightly weaker than Earth's magnetic field. As a result, Saturn's magnetosphere is much smaller than Jupiter's. When Voyager 2 entered the magnetosphere, the solar wind pressure was high and the magnetosphere extended only 19 Saturn radii, or 1.1 million km (712,000 mi), although it enlarged within several hours, and remained so for about three days. Most probably, the magnetic field is generated similarly to that of Jupiter – by currents in the liquid metallic-hydrogen layer called a metallic-hydrogen dynamo. This magnetosphere is efficient at deflecting the solar wind particles from the Sun. The moon Titan orbits within the outer part of Saturn's magnetosphere and contributes plasma from the ionized particles in Titan's outer atmosphere. Saturn's magnetosphere, like Earth's, produces aurorae. The average distance between Saturn and the Sun is over 1.4 billion kilometers (9 AU). With an average orbital speed of 9.68 km/s, it takes Saturn 10,759 Earth days (or about ​29 1⁄2 years) to finish one revolution around the Sun. As a consequence, it forms a near 5:2 mean-motion resonance with Jupiter. The elliptical orbit of Saturn is inclined 2.48° relative to the orbital plane of the Earth. The perihelion and aphelion distances are, respectively, 9.195 and 9.957 AU, on average. The visible features on Saturn rotate at different rates depending on latitude and multiple rotation periods have been assigned to various regions (as in Jupiter's case). Astronomers use three different systems for specifying the rotation rate of Saturn. System I has a period of 10 hr 14 min 00 sec (844.3°/d) and encompasses the Equatorial Zone, the South Equatorial Belt and the North Equatorial Belt. The polar regions are considered to have rotation rates similar to System I. All other Saturnian latitudes, excluding the north and south polar regions, are indicated as System II and have been assigned a rotation period of 10 hr 38 min 25.4 sec (810.76°/d). System III refers to Saturn's internal rotation rate. Based on radio emissions from the planet detected by Voyager 1 and Voyager 2, System III has a rotation period of 10 hr 39 min 22.4 sec (810.8°/d). System III has largely superseded System II. A precise value for the rotation period of the interior remains elusive. While approaching Saturn in 2004, Cassini found that the radio rotation period of Saturn had increased appreciably, to approximately 10 hr 45 min 45 sec (± 36 sec). The latest estimate of Saturn's rotation (as an indicated rotation rate for Saturn as a whole) based on a compilation of various measurements from the Cassini, Voyager and Pioneer probes was reported in September 2007 is 10 hr 32 min 35 sec. In March 2007, it was found that the variation of radio emissions from the planet did not match Saturn's rotation rate. This variance may be caused by geyser activity on Saturn's moon Enceladus. The water vapor emitted into Saturn's orbit by this activity becomes charged and creates a drag upon Saturn's magnetic field, slowing its rotation slightly relative to the rotation of the planet. An apparent oddity for Saturn is that it does not have any known trojan asteroids. These are minor planets that orbit the Sun at the stable Lagrangian points, designated L4 and L5, located at 60° angles to the planet along its orbit. Trojan asteroids have been discovered for Mars, Jupiter, Uranus, and Neptune. Orbital resonance mechanisms, including secular resonance, are believed to be the cause of the missing Saturnian trojans. A montage of Saturn and its principal moons (Dione, Tethys, Mimas, Enceladus, Rhea and Titan; Iapetus not shown). This famous image was created from photographs taken in November 1980 by the Voyager 1 spacecraft. Saturn has 62 known moons, 53 of which have formal names. In addition, there is evidence of dozens to hundreds of moonlets with diameters of 40–500 meters in Saturn's rings, which are not considered to be true moons. Titan, the largest moon, comprises more than 90% of the mass in orbit around Saturn, including the rings. Saturn's second-largest moon, Rhea, may have a tenuous ring system of its own, along with a tenuous atmosphere. Many of the other moons are small: 34 are less than 10 km in diameter and another 14 between 10 and 50 km in diameter. Traditionally, most of Saturn's moons have been named after Titans of Greek mythology. Titan is the only satellite in the Solar System with a major atmosphere, in which a complex organic chemistry occurs. It is the only satellite with hydrocarbon lakes. On 6 June 2013, scientists at the IAA-CSIC reported the detection of polycyclic aromatic hydrocarbons in the upper atmosphere of Titan, a possible precursor for life. On 23 June 2014, NASA claimed to have strong evidence that nitrogen in the atmosphere of Titan came from materials in the Oort cloud, associated with comets, and not from the materials that formed Saturn in earlier times. Saturn's moon Enceladus, which seems similar in chemical makeup to comets, has often been regarded as a potential habitat for microbial life. Evidence of this possibility includes the satellite's salt-rich particles having an "ocean-like" composition that indicates most of Enceladus's expelled ice comes from the evaporation of liquid salt water. A 2015 flyby by Cassini through a plume on Enceladus found most of the ingredients to sustain life forms that live by methanogenesis. 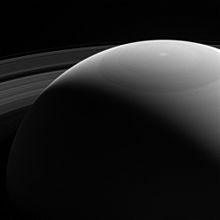 In April 2014, NASA scientists reported the possible beginning of a new moon within the A Ring, which was imaged by Cassini on 15 April 2013. The rings of Saturn (imaged here by Cassini in 2007) are the most massive and conspicuous in the Solar System. False-color UV image of Saturn's outer B and A rings; dirtier ringlets in the Cassini Division and Encke Gap show up red. Saturn is probably best known for the system of planetary rings that makes it visually unique. The rings extend from 6,630 to 120,700 kilometers (4,120 to 75,000 mi) outward from Saturn's equator and average approximately 20 meters (66 ft) in thickness. They are composed predominantly of water ice with trace amounts of tholin impurities, and a peppered coating of approximately 7% amorphous carbon. 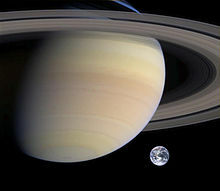 The particles that make up the rings range in size from specks of dust up to 10 m. While the other gas giants also have ring systems, Saturn's is the largest and most visible. There are two main hypotheses regarding the origin of the rings. One hypothesis is that the rings are remnants of a destroyed moon of Saturn. The second hypothesis is that the rings are left over from the original nebular material from which Saturn formed. Some ice in the E ring comes from the moon Enceladus's geysers. The water abundance of the rings vary radially, with the outermost ring A being the most pure in ice water. This abundance variance may be explained by meteor bombardment. Beyond the main rings at a distance of 12 million km from the planet is the sparse Phoebe ring, which is tilted at an angle of 27° to the other rings and, like Phoebe, orbits in retrograde fashion. Some of the moons of Saturn, including Pandora and Prometheus, act as shepherd moons to confine the rings and prevent them from spreading out. Pan and Atlas cause weak, linear density waves in Saturn's rings that have yielded more reliable calculations of their masses. The observation and exploration of Saturn can be divided into three main phases. The first era was ancient observations (such as with the naked eye), before the invention of the modern telescopes. Starting in the 17th century, progressively more advanced telescopic observations from Earth have been made. The third phase is visitation by space probes, by either orbiting or flyby. In the 21st century, observations continue from Earth (including Earth-orbiting observatories like the Hubble Space Telescope) and, until its 2017 retirement, from the Cassini orbiter around Saturn. The Greek scientist Ptolemy based his calculations of Saturn's orbit on observations he made while it was in opposition. In Hindu astrology, there are nine astrological objects, known as Navagrahas. Saturn is known as "Shani" and judges everyone based on the good and bad deeds performed in life. Ancient Chinese and Japanese culture designated the planet Saturn as the "earth star" (土星). This was based on Five Elements which were traditionally used to classify natural elements. In ancient Hebrew, Saturn is called 'Shabbathai'. Its angel is Cassiel. Its intelligence or beneficial spirit is 'Agȋȇl (Hebrew: עֲזָאזֵל‎, translit. ʿAgyal), and its darker spirit (demon) is Zȃzȇl (Hebrew: זאזל‎, translit. Zazl). Zazel has been described as a great angel, invoked in Solomonic magic, who is "effective in love conjurations". In Ottoman Turkish, Urdu and Malay, the name of Zazel is 'Zuhal', derived from the Arabic language (Arabic: زحل‎, translit. Zuhal). Robert Hooke noted the shadows (a and b) cast by both the globe and the rings on each other in this drawing of Saturn in 1666. Saturn's rings require at least a 15-mm-diameter telescope to resolve and thus were not known to exist until Galileo first saw them in 1610. He thought of them as two moons on Saturn's sides. It was not until Christiaan Huygens used greater telescopic magnification that this notion was refuted. Huygens discovered Saturn's moon Titan; Giovanni Domenico Cassini later discovered four other moons: Iapetus, Rhea, Tethys and Dione. In 1675, Cassini discovered the gap now known as the Cassini Division. No further discoveries of significance were made until 1789 when William Herschel discovered two further moons, Mimas and Enceladus. The irregularly shaped satellite Hyperion, which has a resonance with Titan, was discovered in 1848 by a British team. In 1899 William Henry Pickering discovered Phoebe, a highly irregular satellite that does not rotate synchronously with Saturn as the larger moons do. Phoebe was the first such satellite found and it takes more than a year to orbit Saturn in a retrograde orbit. During the early 20th century, research on Titan led to the confirmation in 1944 that it had a thick atmosphere – a feature unique among the Solar System's moons. Pioneer 11 made the first flyby of Saturn in September 1979, when it passed within 20,000 km of the planet's cloud tops. Images were taken of the planet and a few of its moons, although their resolution was too low to discern surface detail. 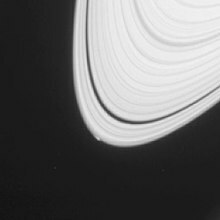 The spacecraft also studied Saturn's rings, revealing the thin F-ring and the fact that dark gaps in the rings are bright when viewed at high phase angle (towards the Sun), meaning that they contain fine light-scattering material. In addition, Pioneer 11 measured the temperature of Titan. In November 1980, the Voyager 1 probe visited the Saturn system. It sent back the first high-resolution images of the planet, its rings and satellites. Surface features of various moons were seen for the first time. Voyager 1 performed a close flyby of Titan, increasing knowledge of the atmosphere of the moon. It proved that Titan's atmosphere is impenetrable in visible wavelengths; therefore no surface details were seen. The flyby changed the spacecraft's trajectory out from the plane of the Solar System. Almost a year later, in August 1981, Voyager 2 continued the study of the Saturn system. More close-up images of Saturn's moons were acquired, as well as evidence of changes in the atmosphere and the rings. Unfortunately, during the flyby, the probe's turnable camera platform stuck for a couple of days and some planned imaging was lost. Saturn's gravity was used to direct the spacecraft's trajectory towards Uranus. The probes discovered and confirmed several new satellites orbiting near or within the planet's rings, as well as the small Maxwell Gap (a gap within the C Ring) and Keeler gap (a 42 km wide gap in the A Ring). The Cassini–Huygens space probe entered orbit around Saturn on 1 July 2004. In June 2004, it conducted a close flyby of Phoebe, sending back high-resolution images and data. Cassini's flyby of Saturn's largest moon, Titan, captured radar images of large lakes and their coastlines with numerous islands and mountains. The orbiter completed two Titan flybys before releasing the Huygens probe on 25 December 2004. Huygens descended onto the surface of Titan on 14 January 2005. Starting in early 2005, scientists used Cassini to track lightning on Saturn. The power of the lightning is approximately 1,000 times that of lightning on Earth. At Enceladus's south pole geysers spray water from many locations along the tiger stripes. In 2006, NASA reported that Cassini had found evidence of liquid water reservoirs no more than tens of meters below the surface that erupt in geysers on Saturn's moon Enceladus. These jets of icy particles are emitted into orbit around Saturn from vents in the moon's south polar region. Over 100 geysers have been identified on Enceladus. In May 2011, NASA scientists reported that Enceladus "is emerging as the most habitable spot beyond Earth in the Solar System for life as we know it". Cassini photographs have revealed a previously undiscovered planetary ring, outside the brighter main rings of Saturn and inside the G and E rings. The source of this ring is hypothesized to be the crashing of a meteoroid off Janus and Epimetheus. In July 2006, images were returned of hydrocarbon lakes near Titan's north pole, the presence of which were confirmed in January 2007. In March 2007, hydrocarbon seas were found near the North pole, the largest of which is almost the size of the Caspian Sea. In October 2006, the probe detected an 8,000 km diameter cyclone-like storm with an eyewall at Saturn's south pole. From 2004 to 2 November 2009, the probe discovered and confirmed eight new satellites. In April 2013 Cassini sent back images of a hurricane at the planet's north pole 20 times larger than those found on Earth, with winds faster than 530 km/h (330 mph). On 15 September 2017, the Cassini-Huygens spacecraft performed the "Grand Finale" of its mission: a number of passes through gaps between Saturn and Saturn's inner rings. The atmospheric entry of Cassini ended the mission. The continued exploration of Saturn is still considered to be a viable option for NASA as part of their ongoing New Frontiers program of missions. NASA previously requested for plans to be put forward for a mission to Saturn that included an atmospheric entry probe and possible investigations into the habitability and possible discovery of life on Saturn's moons Titan and Enceladus. Saturn is the most distant of the five planets easily visible to the naked eye from Earth, the other four being Mercury, Venus, Mars and Jupiter. (Uranus and occasionally 4 Vesta are visible to the naked eye in dark skies.) Saturn appears to the naked eye in the night sky as a bright, yellowish point of light. The mean apparent magnitude of Saturn is 0.46 with a standard deviation of 0.34. Most of the magnitude variation is due to the inclination of the ring system relative to the Sun and Earth. The brightest magnitude, −0.55, occurs near in time to when the plane of the rings is inclined most highly, and the faintest magnitude, 1.17, occurs around the time when they are least inclined. It takes approximately 29.5 years for the planet to complete an entire circuit of the ecliptic against the background constellations of the zodiac. Most people will require an optical aid (very large binoculars or a small telescope) that magnifies at least 30 times to achieve an image of Saturn's rings, in which clear resolution is present. Twice every Saturnian year (roughly every 15 Earth years), the rings briefly disappear from view, due to the way in which they are angled and because they are so thin. Such a "disappearance" will next occur in 2025, but Saturn will be too close to the Sun for any ring-crossing observation to be possible. Saturn eclipses the Sun, as seen from Cassini. The rings are visible, including the F Ring. Saturn and its rings are best seen when the planet is at, or near, opposition, the configuration of a planet when it is at an elongation of 180°, and thus appears opposite the Sun in the sky. A Saturnian opposition occurs every year—approximately every 378 days—and results in the planet appearing at its brightest. Both the Earth and Saturn orbit the Sun on eccentric orbits, which means their distances from the Sun vary over time, and therefore so do their distances from each other, hence varying the brightness of Saturn from one opposition to the next. Saturn also appears brighter when the rings are angled such that they are more visible. For example, during the opposition of 17 December 2002, Saturn appeared at its brightest due to a favorable orientation of its rings relative to the Earth, even though Saturn was closer to the Earth and Sun in late 2003. This is the result of the fact that the moon’s orbit around the Earth is tilted to the orbit of the Earth around the Sun – and so most of the time, the moon will pass above or below Saturn in the sky, and no occultation will occur. It is only when Saturn lies near the point that the moon’s orbit crosses the "plane of the ecliptic" that occultations can happen – and then they occur every time the moon swings by, until Saturn moves away from the crossing point. Farewell to Saturn and moons (Enceladus, Epimetheus, Janus, Mimas, Pandora and Prometheus), by Cassini (21 November 2017). ^ Walter, Elizabeth (21 April 2003). Cambridge Advanced Learner's Dictionary (Second ed.). Cambridge University Press. ISBN 978-0-521-53106-1. ^ Seligman, Courtney. "Rotation Period and Day Length". Archived from the original on 11 August 2011. Retrieved 13 August 2009. ^ a b c d Simon, J.L. ; Bretagnon, P.; Chapront, J.; Chapront-Touzé, M.; Francou, G.; Laskar, J. (February 1994). "Numerical expressions for precession formulae and mean elements for the Moon and planets". Astronomy and Astrophysics. 282 (2): 663–683. Bibcode:1994A&A...282..663S. ^ a b c d e f g h i j Williams, David R. (23 December 2016). "Saturn Fact Sheet". NASA. Archived from the original on 12 October 2017. Retrieved 12 October 2017. ^ "NASA: Solar System Exploration: Planets: Saturn: Facts & Figures". Solarsystem.nasa.gov. 22 March 2011. Archived from the original on 6 October 2011. Retrieved 8 August 2011. ^ a b McCartney, Gretchen; Wendel, JoAnna (18 January 2019). "Scientists Finally Know What Time It Is on Saturn". NASA. Retrieved 18 January 2019. ^ a b Mankovich, Christopher; et al. (17 January 2019). "Cassini Ring Seismology as a Probe of Saturn's Interior. I. Rigid Rotation". The Astrophysical Journal. 871 (1): 1. doi:10.3847/1538-4357/aaf798. ^ Hanel, R.A.; et al. (1983). "Albedo, internal heat flux, and energy balance of Saturn". Icarus. 53 (2): 262–285. Bibcode:1983Icar...53..262H. doi:10.1016/0019-1035(83)90147-1. ^ Mallama, Anthony; Krobusek, Bruce; Pavlov, Hristo (2017). "Comprehensive wide-band magnitudes and albedos for the planets, with applications to exo-planets and Planet Nine". Icarus. 282: 19–33. arXiv:1609.05048. Bibcode:2017Icar..282...19M. doi:10.1016/j.icarus.2016.09.023. ^ a b c d Mallama, A.; Hilton, J.L. (2018). "Computing Apparent Planetary Magnitudes for The Astronomical Almanac". Astronomy and Computing. 25: 10–24. arXiv:1808.01973. Bibcode:2018A&C....25...10M. doi:10.1016/j.ascom.2018.08.002. ^ Knecht, Robin (24 October 2005). "On The Atmospheres Of Different Planets" (PDF). Archived from the original (PDF) on 14 October 2017. Retrieved 14 October 2017. ^ Brainerd, Jerome James (24 November 2004). "Characteristics of Saturn". The Astrophysics Spectator. Archived from the original on 5 October 2011. Retrieved 5 July 2010. ^ "General Information About Saturn". Scienceray. 28 July 2011. Archived from the original on 6 October 2011. Retrieved 17 August 2011. ^ Brainerd, Jerome James (6 October 2004). "Solar System Planets Compared to Earth". The Astrophysics Spectator. Archived from the original on 6 October 2011. Retrieved 5 July 2010. ^ Dunbar, Brian (29 November 2007). "NASA – Saturn". NASA. Archived from the original on 6 October 2011. Retrieved 21 July 2011. ^ Cain, Fraser (3 July 2008). "Mass of Saturn". Universe Today. Retrieved 17 August 2011. ^ a b c Russell, C. T.; et al. (1997). "Saturn: Magnetic Field and Magnetosphere". Science. 207 (4429): 407. Bibcode:1980Sci...207..407S. doi:10.1126/science.207.4429.407. Archived from the original on 5 October 2011. Retrieved 29 April 2007. ^ "The Planets ('Giants')". Science Channel. 8 June 2004. ^ Piazza, Enrico. "Saturn's Moons". Cassini, Equinox Mission. JPL NASA. Archived from the original on 5 October 2011. Retrieved 22 June 2010. ^ Munsell, Kirk (6 April 2005). "The Story of Saturn". NASA Jet Propulsion Laboratory; California Institute of Technology. Archived from the original on 22 August 2011. Retrieved 7 July 2007. ^ Melosh, H. Jay (2011). Planetary Surface Processes. Cambridge Planetary Science. 13. Cambridge University Press. p. 5. ISBN 978-0-521-51418-7. ^ Gregersen, Erik, ed. (2010). Outer Solar System: Jupiter, Saturn, Uranus, Neptune, and the Dwarf Planets. The Rosen Publishing Group. p. 119. ISBN 978-1615300143. ^ "Saturn – The Most Beautiful Planet of our solar system". Preserve Articles. 23 January 2011. Archived from the original on 5 October 2011. Retrieved 24 July 2011. ^ Williams, David R. (16 November 2004). "Jupiter Fact Sheet". NASA. Archived from the original on 5 October 2011. Retrieved 2 August 2007. ^ a b Fortney, Jonathan J.; Nettelmann, Nadine (May 2010). "The Interior Structure, Composition, and Evolution of Giant Planets". Space Science Reviews. 152 (1–4): 423–447. arXiv:0912.0533. Bibcode:2010SSRv..152..423F. doi:10.1007/s11214-009-9582-x. ^ a b c Guillot, Tristan; et al. (2009). "Saturn's Exploration Beyond Cassini-Huygens". In Dougherty, Michele K.; Esposito, Larry W.; Krimigis, Stamatios M. Saturn from Cassini-Huygens. Springer Science+Business Media B.V. p. 745. arXiv:0912.2020. Bibcode:2009sfch.book..745G. doi:10.1007/978-1-4020-9217-6_23. ISBN 978-1-4020-9216-9. ^ Fortney, Jonathan J. (2004). "Looking into the Giant Planets". Science. 305 (5689): 1414–1415. doi:10.1126/science.1101352. PMID 15353790. ^ Saumon, D.; Guillot, T. (July 2004). "Shock Compression of Deuterium and the Interiors of Jupiter and Saturn". The Astrophysical Journal. 609 (2): 1170–1180. arXiv:astro-ph/0403393. Bibcode:2004ApJ...609.1170S. doi:10.1086/421257. ^ "Saturn". BBC. 2000. Archived from the original on 21 August 2011. Retrieved 19 July 2011. ^ Faure, Gunter; Mensing, Teresa M. (2007). Introduction to planetary science: the geological perspective. Springer. p. 337. ISBN 978-1-4020-5233-0. ^ a b c d "Saturn". National Maritime Museum. 2015-08-20. Archived from the original on 6 October 2011. Retrieved 6 July 2007. ^ "Structure of Saturn's Interior". Windows to the Universe. Archived from the original on 21 August 2011. Retrieved 19 July 2011. ^ de Pater, Imke; Lissauer, Jack J. (2010). Planetary Sciences (2nd ed.). Cambridge University Press. pp. 254–255. ISBN 978-0-521-85371-2. ^ "NASA – Saturn". NASA. 2004. Archived from the original on 21 August 2011. Retrieved 27 July 2007. ^ Kramer, Miriam (9 October 2013). "Diamond Rain May Fill Skies of Jupiter and Saturn". Space.com. Retrieved 27 August 2017. ^ Kaplan, Sarah (25 August 2017). "It rains solid diamonds on Uranus and Neptune". The Washington Post. Retrieved 27 August 2017. ^ "Saturn". Universe Guide. Retrieved 29 March 2009. ^ Guillot, Tristan (1999). "Interiors of Giant Planets Inside and Outside the Solar System". Science. 286 (5437): 72–77. Bibcode:1999Sci...286...72G. doi:10.1126/science.286.5437.72. PMID 10506563. ^ Courtin, R.; et al. (1967). "The Composition of Saturn's Atmosphere at Temperate Northern Latitudes from Voyager IRIS spectra". Bulletin of the American Astronomical Society. 15: 831. Bibcode:1983BAAS...15..831C. ^ Cain, Fraser (22 January 2009). "Atmosphere of Saturn". Universe Today. Archived from the original on 5 October 2011. Retrieved 20 July 2011. ^ a b Guerlet, S.; Fouchet, T.; Bézard, B. (November 2008). Charbonnel, C.; Combes, F.; Samadi, R., eds. "Ethane, acetylene and propane distribution in Saturn's stratosphere from Cassini/CIRS limb observations". SF2A-2008: Proceedings of the Annual Meeting of the French Society of Astronomy and Astrophysics: 405. Bibcode:2008sf2a.conf..405G. ^ Martinez, Carolina (5 September 2005). "Cassini Discovers Saturn's Dynamic Clouds Run Deep". NASA. Archived from the original on 5 October 2011. Retrieved 29 April 2007. ^ Orton, Glenn S. (September 2009). "Ground-Based Observational Support for Spacecraft Exploration of the Outer Planets". Earth, Moon, and Planets. 105 (2–4): 143–152. Bibcode:2009EM&P..105..143O. doi:10.1007/s11038-009-9295-x. ^ Dougherty, Michele K.; Esposito, Larry W.; Krimigis, Stamatios M. (2009). Dougherty, Michele K.; Esposito, Larry W.; Krimigis, Stamatios M., eds. Saturn from Cassini-Huygens. Saturn from Cassini-Huygens. Springer. p. 162. Bibcode:2009sfch.book.....D. doi:10.1007/978-1-4020-9217-6. ISBN 978-1-4020-9216-9. ^ Pérez-Hoyos, S.; Sánchez-Laveg, A.; French, R. G.; J. F., Rojas (2005). "Saturn's cloud structure and temporal evolution from ten years of Hubble Space Telescope images (1994–2003)". Icarus. 176 (1): 155–174. Bibcode:2005Icar..176..155P. doi:10.1016/j.icarus.2005.01.014. ^ Kidger, Mark (1992). "The 1990 Great White Spot of Saturn". In Moore, Patrick. 1993 Yearbook of Astronomy. 1993 Yearbook of Astronomy. London: W.W. Norton & Company. pp. 176–215. Bibcode:1992ybas.conf.....M.
^ Hamilton, Calvin J. (1997). "Voyager Saturn Science Summary". Solarviews. Archived from the original on 5 October 2011. Retrieved 5 July 2007. ^ Watanabe, Susan (27 March 2007). "Saturn's Strange Hexagon". NASA. Archived from the original on 1 February 2010. Retrieved 6 July 2007. ^ a b "Warm Polar Vortex on Saturn". Merrillville Community Planetarium. 2007. Archived from the original on 5 October 2011. Retrieved 25 July 2007. ^ Godfrey, D. A. (1988). "A hexagonal feature around Saturn's North Pole". Icarus. 76 (2): 335. Bibcode:1988Icar...76..335G. doi:10.1016/0019-1035(88)90075-9. ^ Sanchez-Lavega, A.; et al. (1993). "Ground-based observations of Saturn's north polar SPOT and hexagon". Science. 260 (5106): 329–32. Bibcode:1993Sci...260..329S. doi:10.1126/science.260.5106.329. PMID 17838249. ^ Overbye, Dennis (6 August 2014). 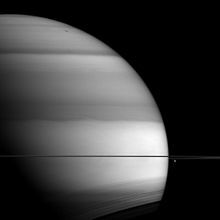 "Storm Chasing on Saturn". New York Times. Retrieved 6 August 2014. ^ "New images show Saturn's weird hexagon cloud". MSNBC. 12 December 2009. Archived from the original on 5 October 2011. Retrieved 29 September 2011. ^ Godfrey, D. A. (9 March 1990). "The Rotation Period of Saturn's Polar Hexagon". Science. 247 (4947): 1206–1208. Bibcode:1990Sci...247.1206G. doi:10.1126/science.247.4947.1206. PMID 17809277. ^ Baines, Kevin H.; et al. (December 2009). "Saturn's north polar cyclone and hexagon at depth revealed by Cassini/VIMS". Planetary and Space Science. 57 (14–15): 1671–1681. Bibcode:2009P&SS...57.1671B. doi:10.1016/j.pss.2009.06.026. ^ Ball, Philip (19 May 2006). "Geometric whirlpools revealed". Nature. doi:10.1038/news060515-17. Bizarre geometric shapes that appear at the center of swirling vortices in planetary atmospheres might be explained by a simple experiment with a bucket of water but correlating this to Saturn's pattern is by no means certain. ^ Aguiar, Ana C. Barbosa; et al. (April 2010). "A laboratory model of Saturn's North Polar Hexagon". Icarus. 206 (2): 755–763. Bibcode:2010Icar..206..755B. doi:10.1016/j.icarus.2009.10.022. Retrieved 20 February 2013. Laboratory experiment of spinning disks in a liquid solution forms vortices around a stable hexagonal pattern similar to that of Saturn's. ^ Sánchez-Lavega, A.; et al. (8 October 2002). "Hubble Space Telescope Observations of the Atmospheric Dynamics in Saturn's South Pole from 1997 to 2002". Bulletin of the American Astronomical Society. 34: 857. Bibcode:2002DPS....34.1307S. Retrieved 6 July 2007. ^ "NASA catalog page for image PIA09187". NASA Planetary Photojournal. Archived from the original on 5 October 2011. Retrieved 23 May 2007. ^ "Huge 'hurricane' rages on Saturn". BBC News. 10 November 2006. Archived from the original on 5 October 2011. Retrieved 29 September 2011. ^ "NASA Sees into the Eye of a Monster Storm on Saturn". NASA. 9 November 2006. Archived from the original on 5 October 2011. Retrieved 20 November 2006. ^ a b Nemiroff, R.; Bonnell, J., eds. (13 November 2006). "A Hurricane Over the South Pole of Saturn". Astronomy Picture of the Day. NASA. Retrieved 1 May 2013. ^ "Cassini Image Shows Saturn Draped in a String of Pearls" (Press release). Carolina Martinez, NASA. 10 November 2006. Retrieved 3 March 2013. ^ "Hubble sees a flickering light display on Saturn". ESA/Hubble Picture of the Week. Retrieved 20 May 2014. ^ a b McDermott, Matthew (2000). "Saturn: Atmosphere and Magnetosphere". Thinkquest Internet Challenge. Archived from the original on 5 October 2011. Retrieved 15 July 2007. ^ "Voyager – Saturn's Magnetosphere". NASA Jet Propulsion Laboratory. 18 October 2010. Archived from the original on 6 October 2011. Retrieved 19 July 2011. ^ Atkinson, Nancy (14 December 2010). "Hot Plasma Explosions Inflate Saturn's Magnetic Field". Universe Today. Archived from the original on 6 October 2011. Retrieved 24 August 2011. ^ Russell, Randy (3 June 2003). "Saturn Magnetosphere Overview". Windows to the Universe. Archived from the original on 6 October 2011. Retrieved 19 July 2011. ^ Cain, Fraser (26 January 2009). "Orbit of Saturn". Universe Today. Archived from the original on 6 October 2011. Retrieved 19 July 2011. ^ Michtchenko, T. A.; Ferraz-Mello, S. (February 2001). "Modeling the 5 : 2 Mean-Motion Resonance in the Jupiter-Saturn Planetary System". Icarus. 149 (2): 357–374. Bibcode:2001Icar..149..357M. doi:10.1006/icar.2000.6539. ^ Jean Meeus, Astronomical Algorithms (Richmond, VA: Willmann-Bell, 1998). Average of the nine extremes on p 273. All are within 0.02 AU of the averages. ^ Kaiser, M. L.; Desch, M. D.; Warwick, J. W.; Pearce, J. B. (1980). "Voyager Detection of Nonthermal Radio Emission from Saturn". Science. 209 (4462): 1238–40. Bibcode:1980Sci...209.1238K. doi:10.1126/science.209.4462.1238. hdl:2060/19800013712. PMID 17811197. ^ Benton, Julius (2006). Saturn and how to observe it. Astronomers' observing guides (11th ed.). Springer Science & Business. p. 136. ISBN 978-1-85233-887-9. ^ "Scientists Find That Saturn's Rotation Period is a Puzzle". NASA. 28 June 2004. Archived from the original on 21 August 2011. Retrieved 22 March 2007. ^ Cain, Fraser (30 June 2008). "Saturn". Universe Today. Archived from the original on 6 October 2011. Retrieved 17 August 2011. ^ Anderson, J. D.; Schubert, G. (2007). "Saturn's gravitational field, internal rotation and interior structure". Science. 317 (5843): 1384–1387. Bibcode:2007Sci...317.1384A. doi:10.1126/science.1144835. PMID 17823351. ^ "Enceladus Geysers Mask the Length of Saturn's Day" (Press release). NASA Jet Propulsion Laboratory. 22 March 2007. Archived from the original on 6 October 2011. Retrieved 22 March 2007. ^ Gurnett, D. A.; et al. (2007). "The Variable Rotation Period of the Inner Region of Saturn's Plasma Disc". Science. 316 (5823): 442–5. Bibcode:2007Sci...316..442G. doi:10.1126/science.1138562. PMID 17379775. ^ Bagenal, F. (2007). "A New Spin on Saturn's Rotation". Science. 316 (5823): 380–1. doi:10.1126/science.1142329. PMID 17446379. ^ Hou, X. Y.; et al. (January 2014). "Saturn Trojans: a dynamical point of view". Monthly Notices of the Royal Astronomical Society. 437 (2): 1420–1433. Bibcode:2014MNRAS.437.1420H. doi:10.1093/mnras/stt1974. ^ "Solar System Dynamics – Planetary Satellite Discovery Circumstances". NASA. 9 March 2015. Retrieved 26 February 2016. ^ Wall, Mike (21 June 2011). "Saturn's 'Ice Queen' Moon Helene Shimmers in New Photo". Space.com. Archived from the original on 6 October 2011. Retrieved 19 July 2011. ^ Tiscareno, Matthew (17 July 2013). "The population of propellers in Saturn's A Ring". The Astronomical Journal. 135 (3): 1083–1091. arXiv:0710.4547. Bibcode:2008AJ....135.1083T. doi:10.1088/0004-6256/135/3/1083. ^ Brunier, Serge (2005). Solar System Voyage. Cambridge University Press. p. 164. ISBN 978-0-521-80724-1. ^ Jones, G. H.; et al. (7 March 2008). "The Dust Halo of Saturn's Largest Icy Moon, Rhea". Science. 319 (5868): 1380–1384. Bibcode:2008Sci...319.1380J. doi:10.1126/science.1151524. PMID 18323452. ^ Atkinson, Nancy (26 November 2010). "Tenuous Oxygen Atmosphere Found Around Saturn's Moon Rhea". Universe Today. Archived from the original on 6 October 2011. Retrieved 20 July 2011. ^ NASA (30 November 2010). "Thin air: Oxygen atmosphere found on Saturn's moon Rhea". ScienceDaily. Archived from the original on 6 October 2011. Retrieved 23 July 2011. ^ Ryan, Clare (26 November 2010). "Cassini reveals oxygen atmosphere of Saturn′s moon Rhea". UCL Mullard Space Science Laboratory. Archived from the original on 6 October 2011. Retrieved 23 July 2011. ^ "Saturn's Known Satellites". Department of Terrestrial Magnetism. Archived from the original on 6 October 2011. Retrieved 22 June 2010. ^ "Cassini Finds Hydrocarbon Rains May Fill Titan Lakes". ScienceDaily. 30 January 2009. Archived from the original on 6 October 2011. Retrieved 19 July 2011. ^ "Voyager – Titan". NASA Jet Propulsion Laboratory. 18 October 2010. Archived from the original on 6 October 2011. Retrieved 19 July 2011. ^ "Evidence of hydrocarbon lakes on Titan". MSNBC. Associated Press. 25 July 2006. Archived from the original on 6 October 2011. Retrieved 19 July 2011. ^ "Hydrocarbon lake finally confirmed on Titan". Cosmos Magazine. 31 July 2008. Archived from the original on 6 October 2011. Retrieved 19 July 2011. ^ López-Puertas, Manuel (6 June 2013). "PAH's in Titan's Upper Atmosphere". CSIC. Retrieved 6 June 2013. ^ Dyches, Preston; et al. (23 June 2014). "Titan's Building Blocks Might Pre-date Saturn". NASA. Retrieved 24 June 2014. ^ Battersby, Stephen (26 March 2008). "Saturn's moon Enceladus surprisingly comet-like". New Scientist. Retrieved 16 April 2015. ^ NASA (21 April 2008). "Could There Be Life On Saturn's Moon Enceladus?". ScienceDaily. Archived from the original on 6 October 2011. Retrieved 19 July 2011. ^ Madrigal, Alexis (24 June 2009). "Hunt for Life on Saturnian Moon Heats Up". Wired Science. Archived from the original on 6 October 2011. Retrieved 19 July 2011. ^ Spotts, Peter N. (28 September 2005). "Life beyond Earth? Potential solar system sites pop up". USA Today. Archived from the original on 6 October 2011. Retrieved 21 July 2011. ^ Pili, Unofre (9 September 2009). "Enceladus: Saturn′s Moon, Has Liquid Ocean of Water". Scienceray. Archived from the original on 6 October 2011. Retrieved 21 July 2011. ^ "Strongest evidence yet indicates Enceladus hiding saltwater ocean". Physorg. 22 June 2011. Archived from the original on 6 October 2011. Retrieved 19 July 2011. ^ Kaufman, Marc (22 June 2011). "Saturn′s moon Enceladus shows evidence of an ocean beneath its surface". Washington Post. Archived from the original on 6 October 2011. Retrieved 19 July 2011. ^ Greicius, Tony; et al. (22 June 2011). "Cassini Captures Ocean-Like Spray at Saturn Moon". NASA. Archived from the original on 6 October 2011. Retrieved 17 September 2011. ^ Chou, Felicia; Dyches, Preston; Weaver, Donna; Villard, Ray (13 April 2017). "NASA Missions Provide New Insights into 'Ocean Worlds' in Our Solar System". NASA. Retrieved 20 April 2017. ^ Platt, Jane; et al. (14 April 2014). "NASA Cassini Images May Reveal Birth of a Saturn Moon". NASA. Retrieved 14 April 2014. ^ Poulet F.; et al. (2002). "The Composition of Saturn's Rings". Icarus. 160 (2): 350. Bibcode:2002Icar..160..350P. doi:10.1006/icar.2002.6967. ^ Porco, Carolyn. "Questions about Saturn's rings". CICLOPS web site. Retrieved 18 June 2017. ^ Spahn, F.; et al. (2006). "Cassini Dust Measurements at Enceladus and Implications for the Origin of the E Ring" (PDF). Science. 311 (5766): 1416–1418. Bibcode:2006Sci...311.1416S. CiteSeerX 10.1.1.466.6748. doi:10.1126/science.1121375. PMID 16527969. ^ "Finger-like Ring Structures In Saturn's E Ring Produced By Enceladus' Geysers". CICLOPS web site. ^ "Icy Tendrils Reaching into Saturn Ring Traced to Their Source". CICLOPS web site (Press release). 14 April 2015. ^ "The Real Lord of the Rings". Science@NASA. 12 February 2002. Archived from the original on 19 August 2016. Retrieved 8 February 2018. ^ Esposito, Larry W.; et al. (February 2005). "Ultraviolet Imaging Spectroscopy Shows an Active Saturnian System". Science. 307 (5713): 1251–1255. Bibcode:2005Sci...307.1251E. doi:10.1126/science.1105606. PMID 15604361. ^ Cowen, Rob (7 November 1999). "Largest known planetary ring discovered". Science News. Archived from the original on 6 October 2011. Retrieved 9 April 2010. ^ Russell, Randy (7 June 2004). "Saturn Moons and Rings". Windows to the Universe. Archived from the original on 6 October 2011. Retrieved 19 July 2011. ^ NASA Jet Propulsion Laboratory (3 March 2005). "NASA's Cassini Spacecraft Continues Making New Discoveries". ScienceDaily. Archived from the original on 6 October 2011. Retrieved 19 July 2011. ^ "Observing Saturn". National Maritime Museum. 2015-08-20. Archived from the original on 22 April 2007. Retrieved 6 July 2007. ^ Sachs, A. (2 May 1974). "Babylonian Observational Astronomy". Philosophical Transactions of the Royal Society of London. 276 (1257): 43–50. Bibcode:1974RSPTA.276...43S. doi:10.1098/rsta.1974.0008. JSTOR 74273. ^ Cicero, De Natura Deorum. ^ a b "Starry Night Times". Imaginova Corp. 2006. Archived from the original on 21 August 2011. Retrieved 5 July 2007. ^ "Greek Names of the Planets". 2010-04-25. Retrieved 14 July 2012. The Greek name of the planet Saturn is Kronos. The Titan Cronus was the father of Zeus, while Saturn was the Roman God of agriculture. See also the Greek article about the planet. ^ a b Corporation, Bonnier (April 1893). "Popular Miscellany – Superstitions about Saturn". The Popular Science Monthly: 862. ^ De Groot, Jan Jakob Maria (1912). Religion in China: universism. a key to the study of Taoism and Confucianism. American lectures on the history of religions. 10. G. P. Putnam's Sons. p. 300. Retrieved 8 January 2010. ^ Crump, Thomas (1992). The Japanese numbers game: the use and understanding of numbers in modern Japan. Nissan Institute/Routledge Japanese studies series. Routledge. pp. 39–40. ISBN 978-0415056090. ^ Hulbert, Homer Bezaleel (1909). The passing of Korea. Doubleday, Page & company. p. 426. Retrieved 8 January 2010. ^ Cessna, Abby (15 November 2009). "When Was Saturn Discovered?". Universe Today. Archived from the original on 6 October 2011. Retrieved 21 July 2011. ^ a b "The Magus, Book I: The Celestial Intelligencer: Chapter XXVIII". Sacred-Text.com. Retrieved 4 August 2018. ^ a b "Saturn in Mythology". CrystalLinks.com. Retrieved 5 August 2018. ^ Beyer, Catherine (8 March 2017). "Planetary Spirit Sigils – 01 Spirit of Saturn". ThoughtCo.com. Retrieved 3 August 2018. ^ a b Eastman, Jack (1998). "Saturn in Binoculars". The Denver Astronomical Society. Archived from the original on 21 August 2011. Retrieved 3 September 2008. ^ Chan, Gary (2000). "Saturn: History Timeline". Archived from the original on 21 August 2011. Retrieved 16 July 2007. ^ Cain, Fraser (3 July 2008). "History of Saturn". Universe Today. Archived from the original on 6 October 2011. Retrieved 24 July 2011. ^ Cain, Fraser (7 July 2008). "Interesting Facts About Saturn". Universe Today. Archived from the original on 6 October 2011. Retrieved 17 September 2011. ^ Cain, Fraser (27 November 2009). 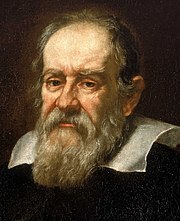 "Who Discovered Saturn?". Universe Today. Archived from the original on 6 October 2011. Retrieved 17 September 2011. ^ Micek, Catherine. "Saturn: History of Discoveries". Archived from the original on 21 August 2011. Retrieved 15 July 2007. ^ a b Barton, Samuel G. (April 1946). "The names of the satellites". Popular Astronomy. Vol. 54. pp. 122–130. Bibcode:1946PA.....54..122B. ^ Kuiper, Gerard P. (November 1944). "Titan: a Satellite with an Atmosphere". Astrophysical Journal. 100: 378–388. Bibcode:1944ApJ...100..378K. doi:10.1086/144679. ^ "The Pioneer 10 & 11 Spacecraft". Mission Descriptions. Archived from the original on 30 January 2006. Retrieved 5 July 2007. ^ a b "Missions to Saturn". The Planetary Society. 2007. Archived from the original on 21 August 2011. Retrieved 24 July 2007. ^ Lebreton, Jean-Pierre; et al. (December 2005). "An overview of the descent and landing of the Huygens probe on Titan". Nature. 438 (7069): 758–764. Bibcode:2005Natur.438..758L. doi:10.1038/nature04347. PMID 16319826. ^ "Astronomers Find Giant Lightning Storm At Saturn". ScienceDaily LLC. 2007. Archived from the original on 21 August 2011. Retrieved 27 July 2007. ^ a b Dyches, Preston; et al. (28 July 2014). "Cassini Spacecraft Reveals 101 Geysers and More on Icy Saturn Moon". NASA. Retrieved 29 July 2014. ^ Pence, Michael (9 March 2006). "NASA's Cassini Discovers Potential Liquid Water on Enceladus". NASA Jet Propulsion Laboratory. Archived from the original on 21 August 2011. Retrieved 3 June 2011. ^ Lovett, Richard A. (31 May 2011). "Enceladus named sweetest spot for alien life". Nature. doi:10.1038/news.2011.337. Archived from the original on 6 October 2011. Retrieved 3 June 2011. ^ Kazan, Casey (2 June 2011). "Saturn's Enceladus Moves to Top of "Most-Likely-to-Have-Life" List". The Daily Galaxy. Archived from the original on 21 August 2011. Retrieved 3 June 2011. ^ Shiga, David (20 September 2007). "Faint new ring discovered around Saturn". NewScientist.com. Archived from the original on 21 August 2011. Retrieved 8 July 2007. ^ Rincon, Paul (14 March 2007). "Probe reveals seas on Saturn moon". BBC. Archived from the original on 6 October 2011. Retrieved 26 September 2007. ^ Rincon, Paul (10 November 2006). "Huge 'hurricane' rages on Saturn". BBC. Archived from the original on 6 October 2011. Retrieved 12 July 2007. ^ "Mission overview – introduction". Cassini Solstice Mission. NASA / JPL. 2010. Archived from the original on 21 August 2011. Retrieved 23 November 2010. ^ "Massive storm at Saturn's north pole". 3 News NZ. 30 April 2013. ^ Brown, Dwayne; Cantillo, Laurie; Dyches, Preston (15 September 2017). "NASA's Cassini Spacecraft Ends Its Historic Exploration of Saturn". NASA. Retrieved 15 September 2017. ^ Chang, Kenneth (14 September 2017). "Cassini Vanishes Into Saturn, Its Mission Celebrated and Mourned". The New York Times. Retrieved 15 September 2017. ^ Foust, Jeff (8 January 2016). "NASA Expands Frontiers of Next New Frontiers Competition". SpaceNews. Retrieved 20 April 2017. ^ "Saturn's Rings Edge-On". Classical Astronomy. 2013. Archived from the original on 5 November 2013. Retrieved 4 August 2013. ^ a b Schmude Jr., Richard W. (Winter 2003). 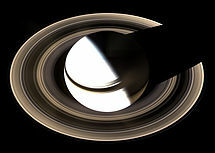 "Saturn in 2002–03". Georgia Journal of Science. 61 (4). ISSN 0147-9369. Retrieved 29 June 2015. ^ a b Tanya Hill; et al. (9 May 2014). "Bright Saturn will blink out across Australia – for an hour, anyway". The Conversation. Retrieved 11 May 2014. Alexander, Arthur Francis O'Donel (1980) . The Planet Saturn - A History of Observation, Theory and Discovery. Dover. ISBN 978-0-486-23927-9. Gore, Rick (July 1981). 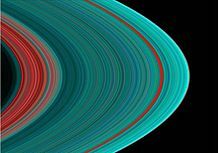 "Voyager 1 at Saturn: Riddles of the Rings". National Geographic. Vol. 160 no. 1. pp. 3–31. ISSN 0027-9358. OCLC 643483454. Lovett, L.; et al. (2006). Saturn: A New View. Harry N. Abrams. ISBN 978-0-8109-3090-2. Karttunen, H.; et al. (2007). Fundamental Astronomy (5th ed.). Springer. ISBN 978-3-540-34143-7. Seidelmann, P. Kenneth; et al. (2007). "Report of the IAU/IAG Working Group on cartographic coordinates and rotational elements: 2006". Celestial Mechanics and Dynamical Astronomy. 98 (3): 155–180. Bibcode:2007CeMDA..98..155S. doi:10.1007/s10569-007-9072-y. de Pater, Imke; Lissauer, Jack J. (2015). Planetary Sciences (2nd updated ed.). Cambridge University Press. p. 250. ISBN 978-0-521-85371-2.